Toro's powerful 4 Amp corded hedge trimmer is designed to get the job done faster and easier. Ergonomic designs with durability features help get the results you are looking for with reduced hand and arm fatigue. The work grip handles help reduce hand fatigue and improve comfort while trimming. Our handy cord lock prevents disruptive unplugging for a smooth and easy trim. 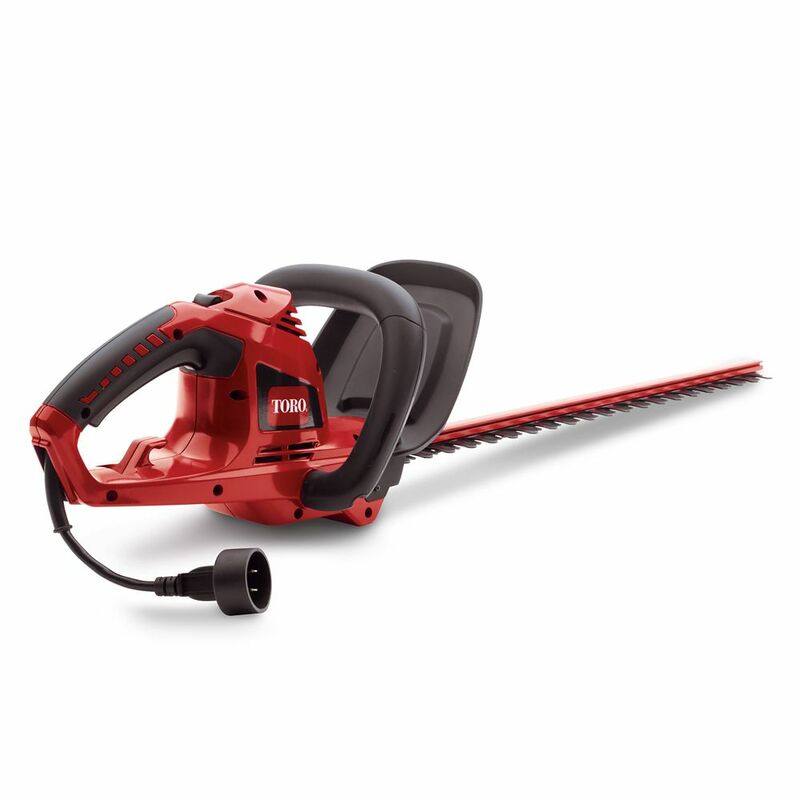 22-inch Corded Electric Hedge Trimmer Toro's powerful 4 Amp corded hedge trimmer is designed to get the job done faster and easier. Ergonomic designs with durability features help get the results you are looking for with reduced hand and arm fatigue. The work grip handles help reduce hand fatigue and improve comfort while trimming. Our handy cord lock prevents disruptive unplugging for a smooth and easy trim. 22-inch Corded Electric Hedge Trimmer is rated 4.6 out of 5 by 290. Rated 2 out of 5 by HomeDepotCustomer from I thought it would cut better than my Black and... I thought it would cut better than my Black and Decker. Rated 5 out of 5 by Fingerless from Worked as expected.... Worked as expected. Rated 5 out of 5 by Chris from The trimmer was delivered in good condition, no problems. ... The trimmer was delivered in good condition, no problems. Rated 5 out of 5 by IndianaDave from This is one good hedge trimmer ... very effective with "dense" shrubs. My old Craftsman trimmer d... This is one good hedge trimmer ... very effective with "dense" shrubs. My old Craftsman trimmer did fine on leafy/branchy bushes such as lilac or burning bushes. However, when it came to dense shrubs, it did not cut effectively as it took 3-5 passes to cut into the shrub. This Toro unit, however, has no such problem. It can make effective cuts in dense shrubs with ease. We have identical shrubs on either side of our garage, and I did the first one using the old Craftsman trimmer and the new Toro on the second shrub. With the Craftsman trimmer it took about 75 minutes to do one shrub, and it took about 40 minutes to trim the second shrub with the Toro unit. (Plus, the second shrub is about 10% larger in diameter.) I have a bad back, so the time saved bending down and raising and lowering my torso is greatly appreciated. I have used it just once, but already I feel like trimming my shrubs and bushes will be much less of a chore in the future. In addition, the unit is relatively light and easy to use. The primary reason I purchased this Toro was the positive ratings and comments in customer reviews. Now that I've tried it, I see why the ratings were so high. Congratulations Toro!